Public speaking and Evangelism is now getting a hang on me. I am loving the travelling, the interactions and the feeling of being able to enlighten someone with the little knowledge in my mind's bank. This time it was Bhubaneshwar that I got a chance of visiting. A student of the CET college, Bhubaneshwar, had contacted Kaustav (a Mozilla Rep) for hosting a Mozilla event in their college. When Kaustav shared the idea of hosting an event in Bhubaneshwar, the offer was too tempting for me to refuse. Bhubaneshwar is a small city in Orissa where there are quite a few renowned colleges. These colleges hosts some of the tetchiest minds of India. The city never had much exposure to Open Source in general. It was a platinum opportunity (golden is surely an understatement here) for us to introduce the Mozilla world to these techy minds. 21st and 22nd of December were chosen as the dates of the event. Kaustav and I were planning for a MDN event in India for quite a long time. MDN is probably one of those rarely touched topics in Mozilla events (speaking of the scenario witnessed in India). After the new look of the MDN site, we thought it was the perfect time to introduce this Mozilla project to the Indian developers. We had never hosted MDN events before...rather the two of us ourselves are pretty new to MDN. The best way of delivering this topic, the crowd's reaction to this topic...everything were our points of observation for this experiment event. We had a thorough discussion with the MDN team (Luke, Ali, Maris) and formed a rough structure for this. Since MDN was a bit risky factor (the chances of a flop show was pretty high), we couldn't have had only MDN track. We came up with the idea of having a 2 day event, where day 1 could have some Mozilla introduction and Webmaking and day 2 could focus on MDN. Generally, for most of the Mozilla events, we fly down to the venue...but this time we decided to take the train. The journey from Kolkata to Bhubaneshwar is of around 8 hours by train. Sayak (Mozilla rep, Mozilla mentor and currently a council member), Nayanika (a newbie in the Mozilla world) and I decided to travel together. The entire 8 hours of this train trip was more like a training and induction session for Nayanika (ya, we had to torture her...after all when two passionate Mozillians meet, that is what they can do best). It was great to see how Nayanika was already aware of most of the Mozilla projects. She has been contributing to Mozilla for the last few months and have also volunteered for a few local events in Kolkata. The fun began on the 21st of December 2013. 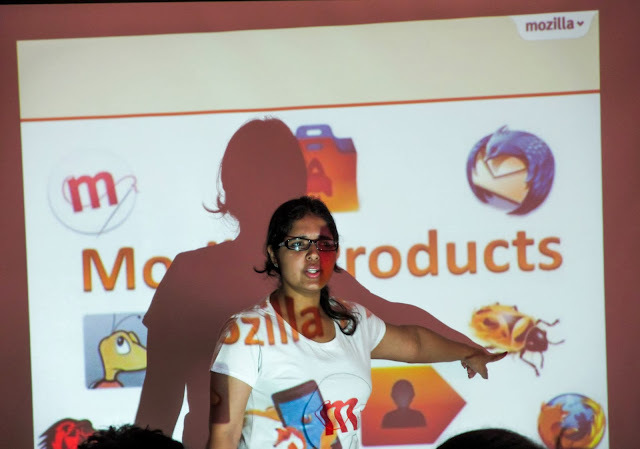 I began the event with an interactive session on the Mozilla introduction followed by a short talk on the different Mozilla projects and the products. Once the crowd had a brief idea about what Mozilla is and what Mozilla does, Sayak took over to turn the 'users of the web' to 'makers of the web' through his session on Webmaker. Kaustav, Nayanika and I did assist Sayak through this session for the rest of the day. We concluded day one by giving away prizes against the best makes of the day. Some of the awesome makes of this day can be found here. The developers were not exactly at their 'pro' level and thus, Kuma was not a very easy food on their plates. We didn't have a list of untagged pages and the task list we had, was a bit too heavy for our target audience. Post lunch, Sayak took the stage again and this time, it was his favourite topic that he got to talk about - Firefox OS. The session was so great that we had to stay back for an extra hour (after the official end of the event), to interact with the enthusiastic crowd and resolve their queries. Things surely went wrong and many things could have been done better, but I would count this event as one of our biggest learning, mainly as we are planning 2014 to be highly MDN focused.